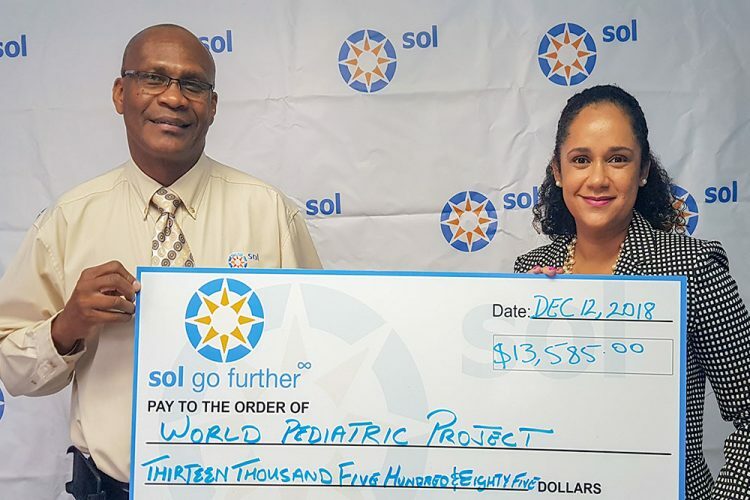 The World Pediatric Project (WPP) received an early Christmas gift of $13,585.00 from fuel provider, SOL EC Ltd.
Steve Francis, General Manager of SOL, indicated that as part of SOL’s social investment programme, the company is pleased with the work being done by the WPP in assisting children in St Vincent and the Grenadines and the Eastern Caribbean with surgical and other medical assistance, and is happy to assist the WPP. 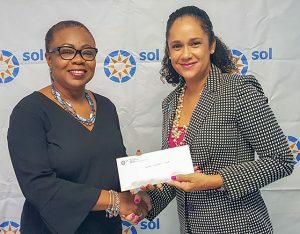 Lauren Mc Intosh, Executive Director of WPP expressed her gratitude to SOL for its significant contribution, which she said, will assist WPP in its operations. Yolande Barbour, SOL’s Accountant, handed over a second donation of $886.70 to Mc Intosh. The sum is a donation from SOL’s staff who have been involved in “Fitness Walks”. The money was derived from the sale of t-shirts. The WPP, since its commencement of operations in St Vincent and the Grenadines in 2002, as at August 31, 2018 provided services to the value of 27.16 million United States dollars. One hundred and seventy-seven (177) children received medical care in the United States (US$15.88 million) and there were 131 visiting surgical/diagnostic teams who treated children in St Vincent at a value of 11.28 million United States dollars.